This new young adult book series, from the author of the Undead Bar Association Series, features the adventures of a group of ghost hunters. 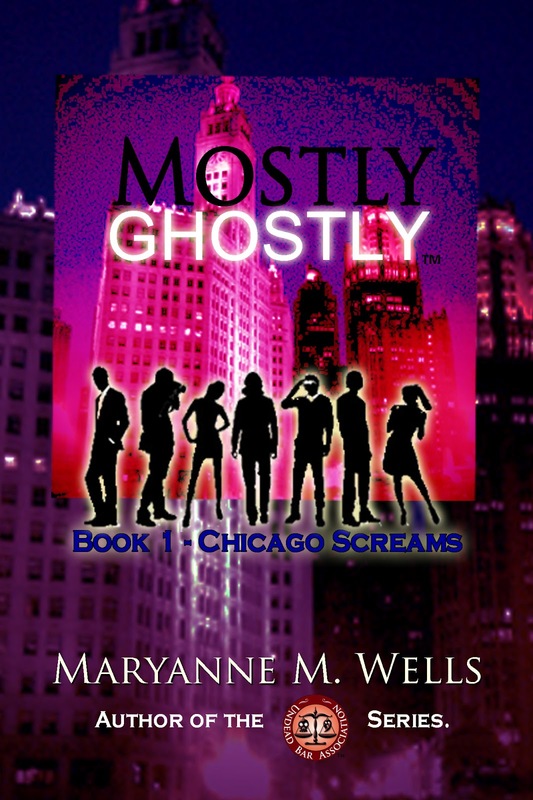 In book one, Chicago Screams, the team fights to save a Chicago nightclub from ghosts and a dark, malicious essence. At the same time, the team scrambles to find a new host for their TV show, Mostly Ghostly. "The new series ties in beautifully with the Undead Bar Association," reports author Maryanne Wells. "In fact, the Mostly Ghostly TV show was mentioned in the first UBA book. I'm planning some fun crossovers between the two series, in future books." Chicago Screams, the first Mostly Ghostly book, will be published on Cyber Monday (December 2). Originally, Wells planned to release a different book on that date. "December 2 was supposed to be the publish date for Deadhand Control, the fourth book of the Undead Bar Association series. But, Deadhand Control requires more research than other books I've written, and the publishing schedule had to change," Wells said. "Also, I decided to launch a Kickstarter project for Deadhand Control. With all the changes, that book's publish date has been moved to February 2014. That gave Mostly Ghostly a chance to premiere in 2013." Wells began work on the Mostly Ghostly more than a year ago, but did not present it to anyone until recently. According to Wells, it was just writing she did for her own entertainment. "I showed the idea for the first Mostly Ghostly book to my editor, and she liked it. So, we decided to pull in some YA beta readers, and go from there." Last year, when Wells first began the transition from writing short stories for www.undeadbarassociation.com to writing and publishing books, she made two promises to readers. First, there would always be a Maryanne Wells book published the Monday after Thanksgiving. Second, fans of the Undead Bar Association series would have two new books made available to them each year. "With the publication of Mostly Ghostly - Chicago Screams, we'll be keeping both promises," Wells announced. "Fans of the UBA books will enjoy the suspense, fast pace, ghosts, and history in Mostly Ghostly. And, I think new readers will enjoy these books too, for the action and attitude." Unlike the Undead Bar Association series, Mostly Ghostly won't blend law or legal suspense into the plot. Wells also promises that language in the young adult series will be cleaner than that in most UBA stories. As for Deadhand Control, Wells reports, "We'll be launching the Kickstarter project next week. Stay tuned for details!"